Crutcheze crutch bag is designed by healthcare professionals with innovative anti-microbial medical performance materials providing you a best of breed crutch bag at a great value price! Lightweight, stretchable and durable to carry all personal items, such as 16.9-24 oz water bottle, mini tablet, etc. The crutch bag's pouch features an inside liner pocket to securely carry and access your medication, cell phone or other electronic devices. Top opening of the bag has been reinforced to support the straps, closures and weight of the bag. Main body of the bag stretches across the width to provide ample room for items. The bag's look and feel may vary depending upon the user's contents. Main pouch specs: 6.5"Wx9"L rectangular design plus side fashion stretch pocket for more storage. The bag fabric is liquid proof and has been treated with an EPA approved anti-microbial product that resists the growth of bacteria, provides odor protection, increases hygiene and reduces staining. We use the most innovative materials, technology and designs to produce our high quality products, which are designed by healthcare professionals and tested by independent testers to ensure the highest standards resulting in 1,000's of satisfied customers. Made in the USA. 100% satisfaction guarantee. 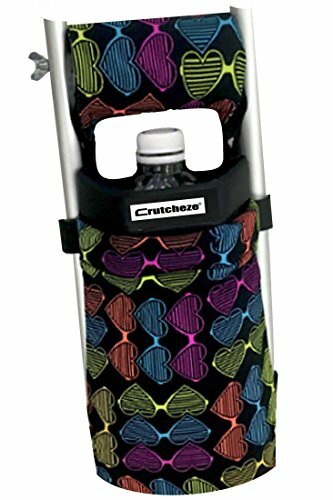 Crutch bag's main pouch is lightweight, stretchable, water proof, stain and bacteria resistant. Provides lots of room for personal items plus stretchable side pocket for extra carrying space. Matching hand grip pads are sold separately as a crutch padded covers set. Easily attaches to crutches using removable, adjustable straps with hook and loop for secure fit. Made in USA. 100% Satisfaction Guarantee. One size fits all standard youth and adult underarm crutches. Machine wash, cold water, line dry. If you have any questions about this product by Crutcheze, contact us by completing and submitting the form below. If you are looking for a specif part number, please include it with your message.